Kanazawa has three geisha districts and Kazuemachi is the least touristic and smallest one. Least touristic doesn’t mean “not worth”. Sometimes you can find even better things in less-know place. Since the district is located between Omicho or Kanazawa castle and Higashi-chaya-gai, access is good. What is geisha? What is geisha restaurants? 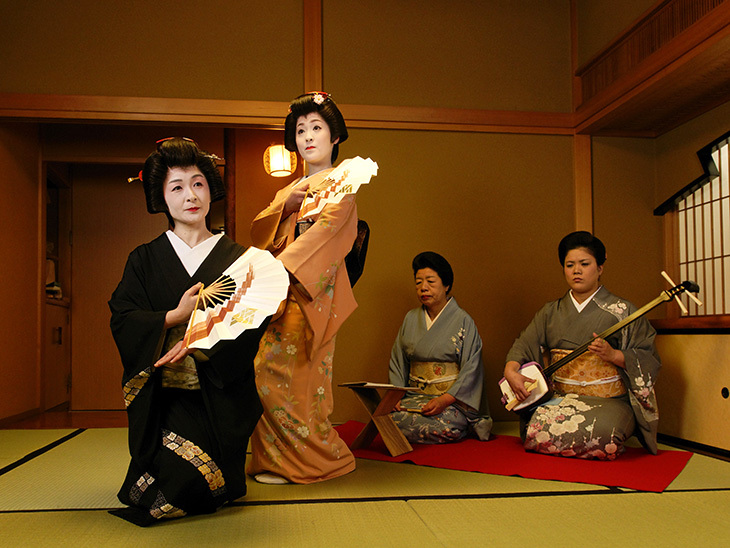 Geisha is a performer who entertains customers by playing instruments such as Japanese bamboo flute, drum and guitar. They perform dance as well. They are wearing Japanese traditional dresses – kimono. Kazuemachi has two faces. The district is facing Asano river, so it is light and view from there is panoramic. 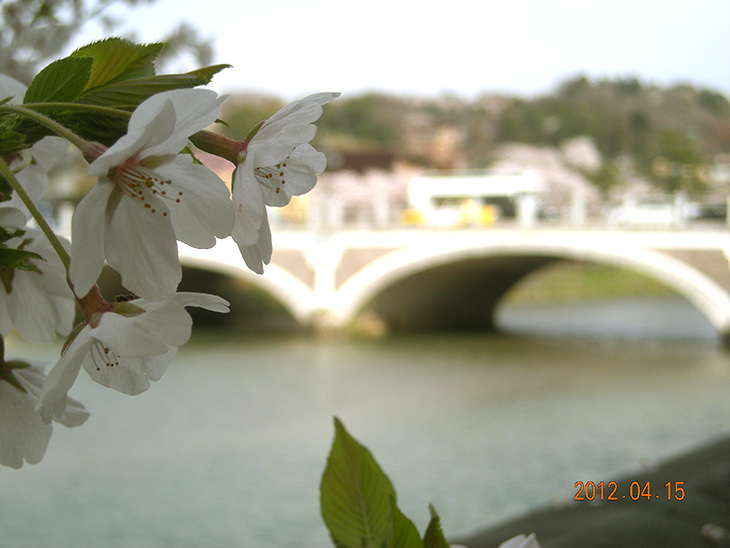 In Spring, cherry blossom by the river is particularly nice. You can see another face when you go into the one block off from the main street. The width of the street is only 1m and three stories wooden buildings are lined both sides. So, the streets is very dark. Even there is a street called Kuragari-zaka, which literally means “street of darkness”. Kuboichiototsurugigu is a shrine opposite side of Asano river. 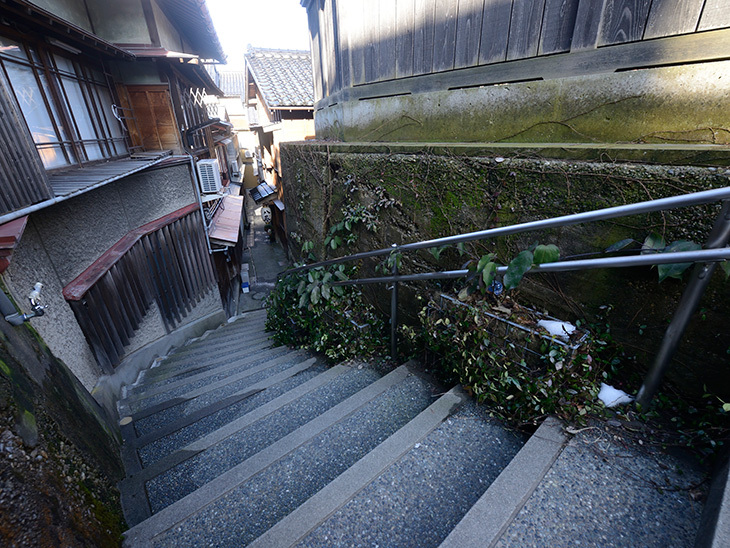 Kuragari-izaka, street of darkness, goes through from this shrine. Unlike other touristic shrine, Kuboichiototsurugigu is always peaceful. Gallery Kyoka is located beside Kuragarizaka. In this gallery, Kanazawa’s craft souvenirs are sold – paper craft, lacquerware. 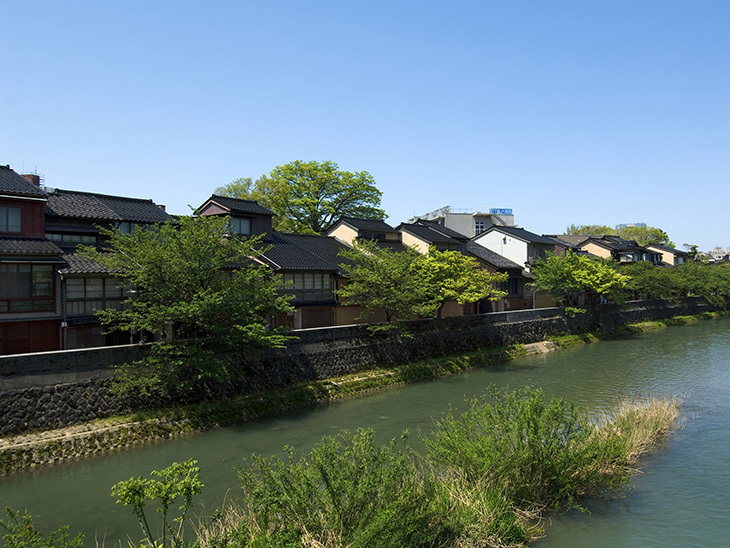 Kanazawa has two major rivers. One is Saigawa river, flows in the city centre, and another is Asanogawa river. Asanogawa river is often described “Female river” because the river is calm and shallow meanwhile Sai river is described “Man river”. By clockwise (right loop) bus, the closest bus stop is Hashiba-cho (RL5). Cross Asano river and go to downstream and soon you will find Kazue-machi district. By counterclockwise (left loop) bus, the closest bus stop is Hashiba-cho (LL10). Walk straight and cross the traffic light. When you see Asano river, the left side (downstream of the river) is Kazue-machi.